Granite countertops, vanity-tops, stone tiled shower and floor are popular choices among interior designers and home owners due to the stunning natural beauty of the stones and their practical functionalities. The surface of the granite is tough, durable, and yet easy to clean and care. It brings natural beauty into your living space and adds class and elegance to your home. 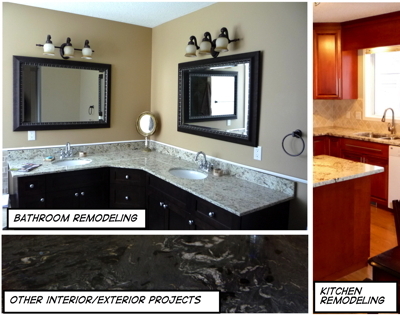 Sun Granite & Stone Inc. makes high quality, customized fabrication for granite kitchen countertops and bath vanity-tops, and provides kitchen countertops and bath vanity-tops installation, shower and floor tiling services in Sherwood Park, Edmonton, and Fort Saskatchewan region. Besides granite it also works with quartz and other natural stones. Sun Granite & Stone Inc. fabricates and installs granite kitchen countertops, bath vanity-tops, shower and floor stone tiles for new residential homes and commercial buildings, and also takes on kitchen and bath remodeling work for home renovation projects. It offers top quality work, competitive price and quick turnaround time. For your granite kitchen countertops, bath vanity-tops, shower and floor stone tiling work, for your kitchen/bath remodeling and other interior/exterior projects, call us today at (780) 464-5978 to get a FREE on-site no-obligation estimate. Visit our showroom, go through the wide selection of colors/patterns of granite, quartz, and other natural stones to find the material for your project. Sun Granite & Stone Inc is a proud member of the Best Business Bureaus. At Sun Granite & Stone Inc, we see Customer Satisfaction as our lifeline.